The next step up in quad line kites, built for high wind performance! Includes kite, handles, DVD and an extra 1/4" performance leading edge! The Rev 1.5 SLE continues to be the most dominant quadline sportwing on the market today, both with leisure fliers and competitors alike. The 1.5 SLE has a great sail-to-weight ratio which gives the pilot the freedom to fly in a wide range of wind conditions. The ripstop high-grade nylon sail teamed with the Super Leading Edge has created a sportwing that is quicker (clocked flying over 45 mph) with enhanced controllability. And you'll now find a wide variety of color patterns, including black center panels lower down on this page. This combination of speed and control make this model a very responsive and precise flying machine. The SLE boasts an amazingly crisp clean dive-stop maneuver, very impressive to the crowds you will attract flying this sportwing. 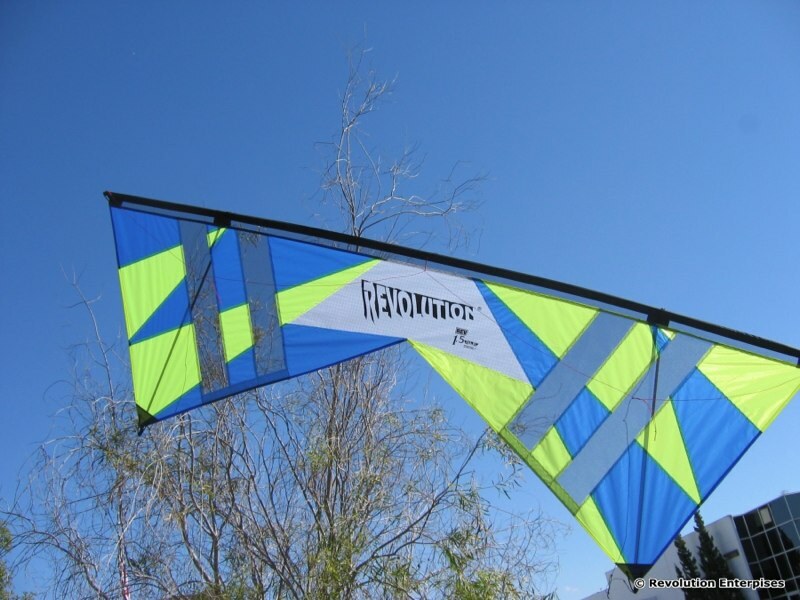 With a higher performance design and materials, the SLE is one of the most popular Revolution Kites available. Click the button below to add the Rev 1.5 SLE Quad Line (Vented), Black/Lime/Blue to your wish list.